Synopsis: A trio of bomb-squad team members hunt down explosives in Iraq. Dealing with death, shattered nerves and their vastly different personalities, they struggle to find ways to pull through. Hurt Locker joins Inglorious Basterds as the two best war movies in a long time. It is so tightly wound and suspenseful that I found that the back of my neck was sore by the end of the film. Essentially, it is an action movie that also does an excellent job at demonstrating the drama and effects of war on the soldiers involved. Luckily, it doesn’t try to comment on the politics of whether or not the United States should be in Iraq. We are in it, like it or not, and this is a story of those who are actually there. The movie focuses on a bomb squad made up three different personalities: the “wild man” leader (played by Renner in an Oscar-nominated performance), the sure-handed but unhappy second-in-command, and the young, cowardly “specialist”. Each, in their own way, ends up bending – if not breaking – and we see that none of them, no matter how brave, crazy or intelligent the soldier, is immune to the soul-crushing situations experienced while occupying a foreign country. The true strength of the film though isn’t in the character arcs; it is the suspense of the bomb deactivation scenes and the shootouts. These scenes lay the groundwork for our understanding of what drives the soldiers. While creating incredibly effective suspense, Bigelow avoids a common Hollywood mistake: She doesn’t constantly have the camera frenetically bobbing around for the sake of mimicking the insanity of war. When movement is called for, she has the camera move. But when the soldiers are forced to sit and watch, the camera sits and watches too. Herein lies perhaps the worst of it for the bomb squad: What will they find the next time they are called out? The apprehension is palpable. When it is too still, too quiet, they tense for the worst; we as viewers follow their lead. 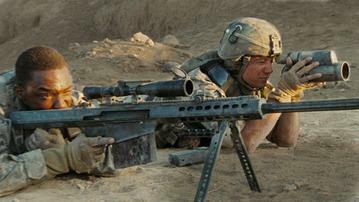 One of my favorite sequences is the long-distance shootout with the Iraqi snipers. It paints the perfect picture of intensity, focus and teamwork that these soldiers absolutely had to master to survive. When things get ugly, who falls into place and who falls apart? The long, quiet shots of waiting are loaded with power far behind any clever dialogue might have accomplished. There are a few minor problems with the film, like the oddly off-key and self-conscious performance of David Morse (fortunately in a very small role) and the awkward change in tone for the closing scenes. After playing above the Hollywood norms for much of the film, it feels like Bigelow did not know how to wrap things up, so she opted for a Hollywood-style ending scene, slo-mo and all. It almost works, if I’m correctly interpreting her attempt. But I still didn’t particularly like that part of it. Highly recommended, and certainly a better movie than Avatar (apparently its chief Oscar rival for Best Picture). This entry was posted on February 7, 2010 by Ian Kay. It was filed under The Hurt Locker (2009) .